Welcome to the Collectors Guide to Disney Snowglobes. 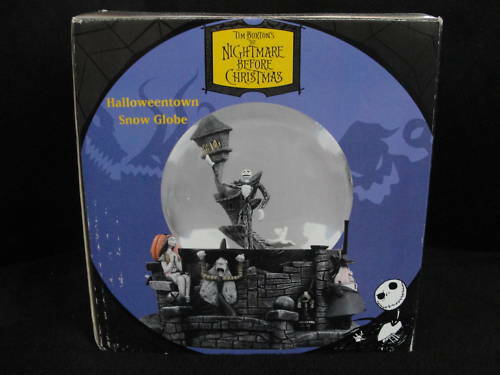 Information on over 2900 Disney snow globes. Items listed are presented for information purposes and are not for sale. 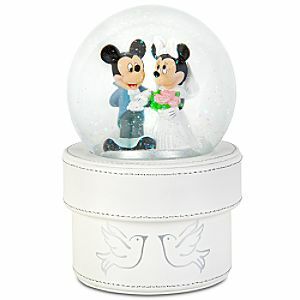 Description: The bride and groom share a romantic moment on this Minnie and Mickey Mouse Wedding Snowglobe Gift Box. 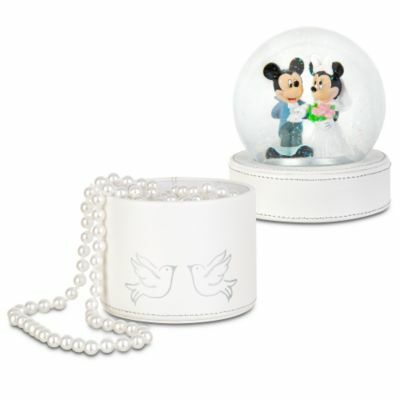 The white faux leather box, featuring the Minnie and Mickey snowglobe on the lid, is the perfect presentation box for that special wedding gift. 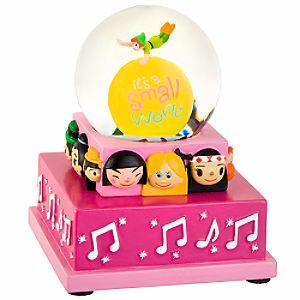 Description: It's a world of laughter and hopes revisited with our charming it's a small world Mini Snowglobe. Push the switch to hear the iconic music remind you of the beloved Disneyland attraction and its timeless message. Music: "It's A Small World"
Size: 3'' H x 2 1/2'' -sq. Description: Sorceror Mickey pulls some Disney magic out of his hat including Captain Hook's Pirate Ship, a carousel and the Tower of Terror. 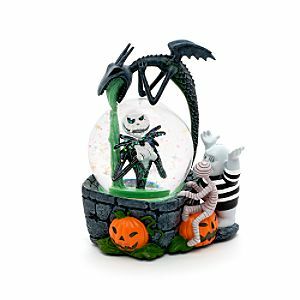 Description: Summon up a spooky spectacle onto any shelf with this resin ornament, which features Jack Skellington inside the glitter filled dome, surrounded by other creepy characters from The Nightmare Before Christmas. 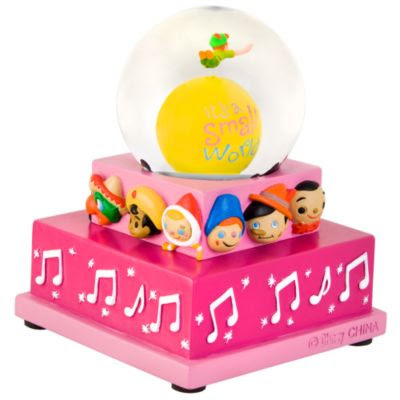 Description: Belle sits with her feathered friend in this Mini Belle Snowglobe. 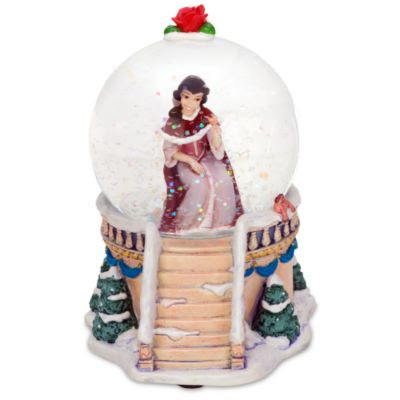 An enchanted rose decorates the top of this snow-covered Belle snowglobe that captures a treasured scene inspired by Disney's beloved Beauty and the Beast. Description: Journey under the sea with our beautiful Mini Clam Shell Ariel Snowglobe. Ariel holds a flower in her hand and dreams of the world above. 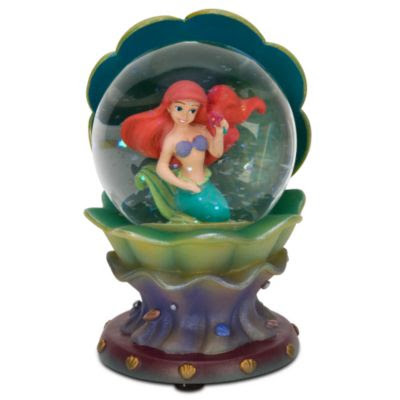 The cool colors and detail of this Little Mermaid snowglobe is sure to make your collection complete! Description: Bibbidi-Bobbidi-Boo! 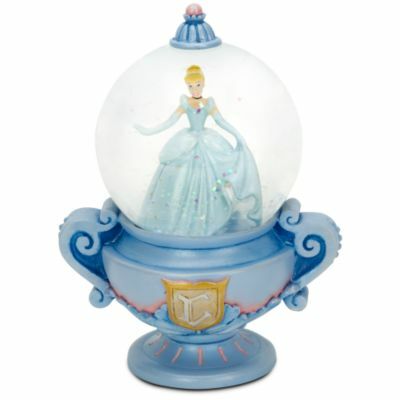 Cinderella's rags have been transformed into her beautiful ball gown in this Mini Cinderella Snowglobe. 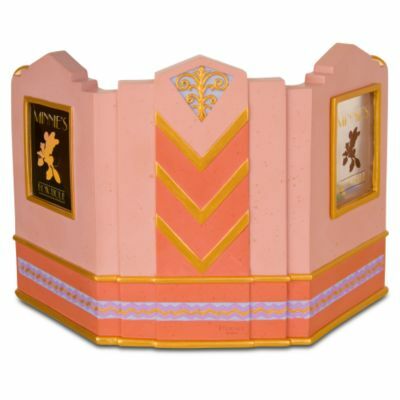 Set atop an elegant base featuring the letter ''C'', the Disney Princess prepares for her glittering evening. Description: Make this The Little Mermaid Snowglobe part of your world. 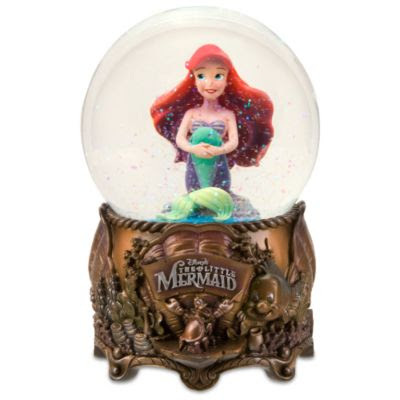 Ariel sits atop a rock while the base features Sebastian conducting events below in this Ariel snowglobe that your little mermaid will treasure. Description: Mickey and Minnie's romance gets off to a flying start with this Plane Crazy Minnie and Mickey Mouse Snowglobe. 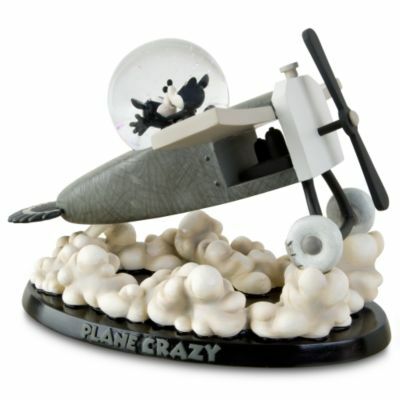 The sweethearts share a tender kiss above the clouds in this Plane Crazy snowglobe inspired by the 1928 Disney short. 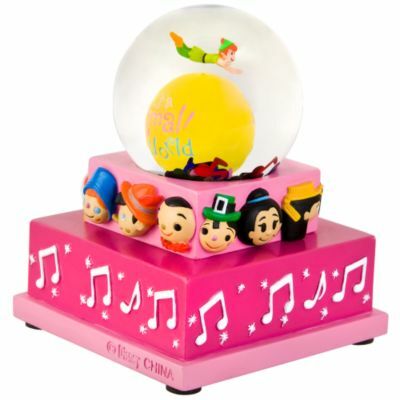 Description: It's Mickey at the helm of this Mini Steamboat Willie Mickey Mouse Snowglobe. 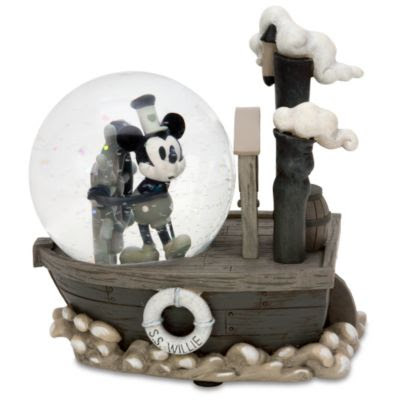 Inspired by Mickey's movie debut, this Steamboat Willie snowglobe is a glittering reminder that it all started with a mouse. 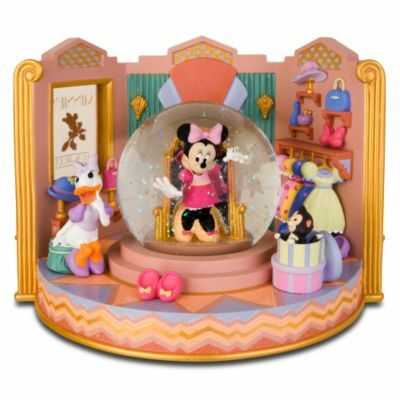 Description: There'a world of fun in store with Minnie's Bow-Tique Minnie Mouse Snowglobe. This colorful scene inside Minnie's Bow-Tique shop features Minnie, Daisy Duck and little Figaro playfully popping out of a hat box. 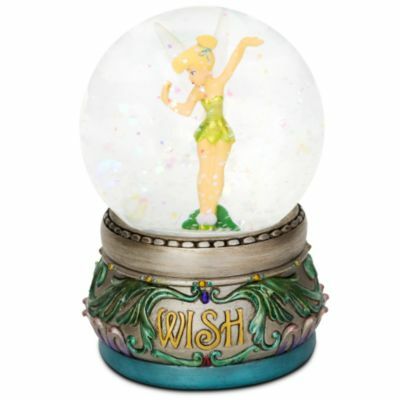 Description: Make your ''Wish'' come true with this Mini Tinker Bell Snowglobe. Shake the elegant snowglobe, with the word ''Wish'' featured on the base, and see glittering pixie dust swirl all around little Tink. 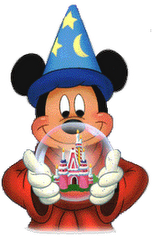 To look up a specific Disney snowglobe, scroll down this column to the labels section and click on a label that describes what you are searching for. All the snowglobes that are marked with that label will appear.